Sunday, 30th April, 9am-3pm, UPMARKET at Trinidad Country Club (Maraval, Trinidad). Walk with your grocery bags and cash for Trinidad’s premier gourmet market featuring local food artisans, caterers, chefs and farmers alongside artists and other artisans selling jewelry, soaps and lotions, art and more. FREE ENTRY! Link to Facebook event page. Ministry of Food Production Farmers Training Centre’s TRAINING COURSES: Classes may include Aquaponics for Home Gardeners; Banana & Plant Production; Cocoa Production; and Marketing Fresh Fruits & Vegetables in Local and Foreign Markets. 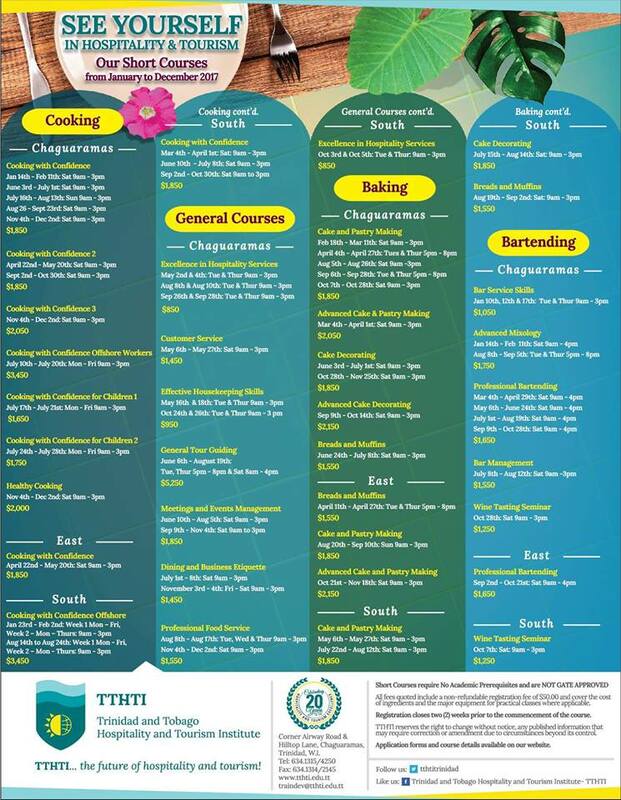 Classes are offered in Caroni, Curepe, Centeno, Penal, Point Fortin, Princes Town and Sangre Grande. Link to APRIL 2017 schedule and booking information. FREE! 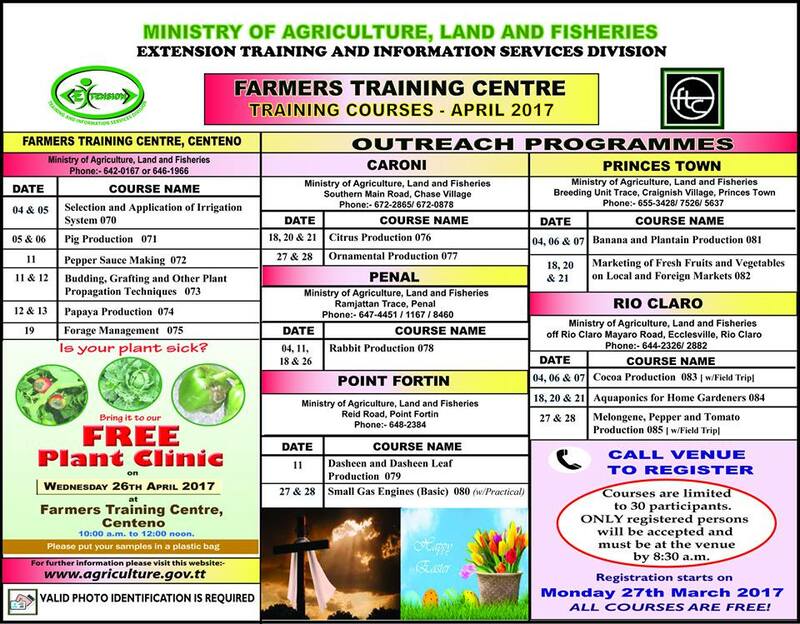 Also coming in May 2017 is a FREE Commercial Aquaculture Training Course from the Ministry of Agriculture, Land & Fisheries. 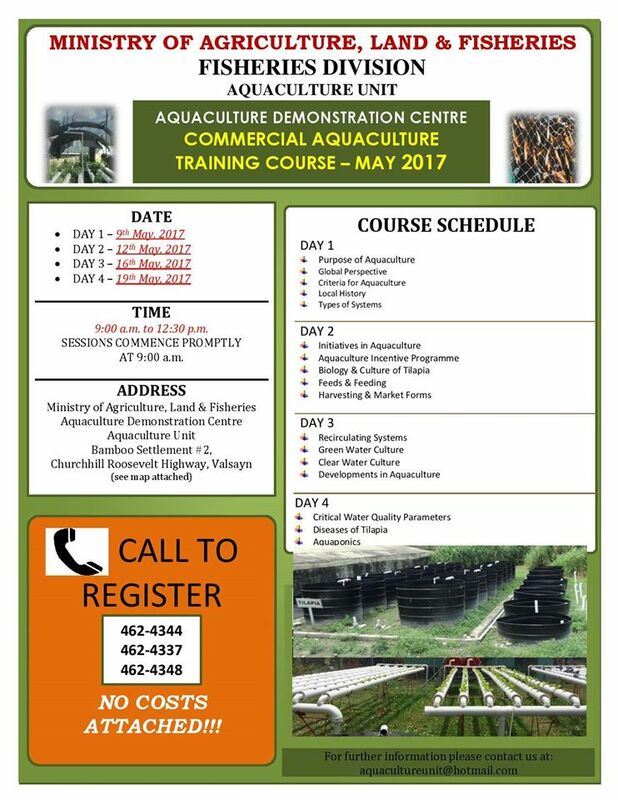 Link to Aquaculture May 2017 course schedule and more details. FREE! NEW RESTAURANTS, RELOCATIONS & REOPENINGS and PLACES TO TRY! LIVET GOURMET (Woodbrook, Trinidad) – Currently located in Barataria, but coming in May 2017 to Ariapita Avenue, Livet Gourmet is a “health and wellness restaurant featuring vegetarian, vegan, gluten free, lactose free, sugar free, preservative free, processed free options for tasty healthy versions of popular dishes we know and love e.g. coocoo(made with quinoa), the world’s tastiest doubles(gluten free), stew mushrooms, calalloo, curry, green fig salad(free of mayo) dairy free ice cream and cheese cakes, sweet potato fries, store made condiments and so much more.” (868) 638-9437. ALL MY TEA Shop (Woodbrook, Trinidad) – Coming soon to D’ Rite Stuff at #44 De Verteuil Street! All My Tea Shop will feature 35+ varieties of loose teas available by bag or cup, specialty coffees and homemade eats such as muffins, cookies, scones, salads, and sandwiches! PAPRIKA BISTRO (West Mall, Westmoorings, Trinidad) – Coming soon to West Mall! BLOOM’S IMPORTS (Maraval, Trinidad) – Opening a second location on 27th April 2017 on Long Circular Road (next door to Rituals/across from RBC Bank). HENDERSONS’ KITCHEN (Cascade, Trinidad) – “Farm to table” restaurant serving grab-and-go meals or dine at the counter. Link to Hendersons’ Kitchen pictures. (868) 621-2325. SWEET SERENI-TEA CAFE (Woodbrook, Trinidad) – Opened in March 2017 on De Verteuil Street. (868) 788-8004. CHOCOLATE BAR CAFE (Santa Cruz, Trinidad) – Opened in February 2017. 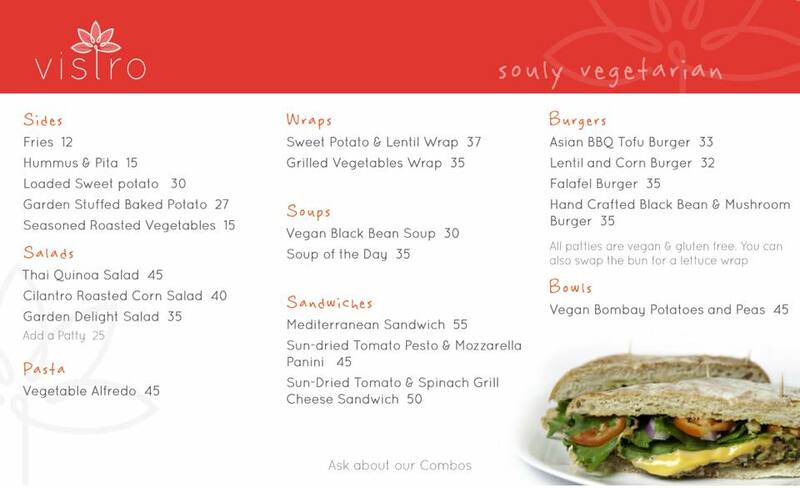 VISTRO ‘SOULY VEGETARIAN’ (St. James, Trinidad) – Opened in the Food Court of Long Circular Mall in February 2017. (868) 785-7910. Link to menu. HOUSE OF SAKURA (St. James, Trinidad) – Sushi-Asian restaurant opened on Mucurapo Road in January 2017. Link to menu and pictures. (868) 299-9536. FISH FROLIC (Trinidad) – Catering service offering fortnightly home and/or office delivery of Jamaican escoveitched fish and festival. Email fishfrolictt@gmail.com or send Facebook message to order. ROLL TT (SouthPark, San Fernando, Trinidad) – Sushi/Asian restaurant opened its second location in April 2017. ISLAND BEER CHILL & GRILL (SouthPark, San Fernando, Trinidad) – Opened its second location in February 2017. LA CANTINA (C3 Centre, San Fernando, Trinidad) – Opened its third location in April 2017 (other two locations are in Port of Spain, Trinidad and Crown Point, Tobago). BREADOLOGY (C3 Centre , San Fernando, Trinidad) – Opened in December 2016. 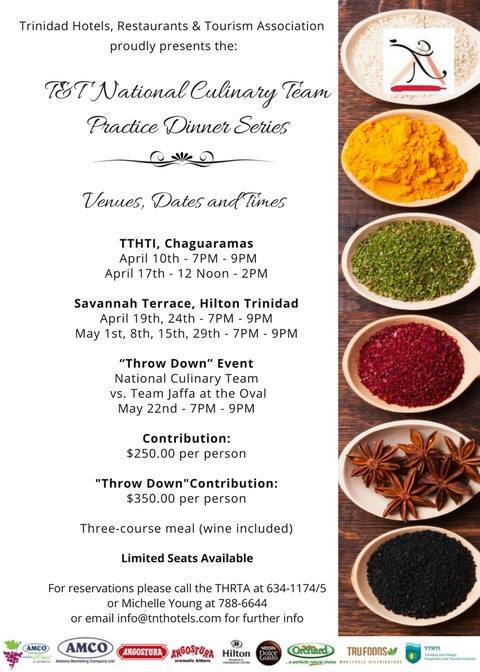 Tags: Trinidad Food Wine Event Calendar. Bookmark the permalink.